Liv Wan. The Spruce Eats, 2016. Chinese and Taiwanese people like to eat Tangyuan (湯圓) during the Yuanxiao Festival. The Yuanxiao Festival is more commonly known as the Lantern Festival and Winter Solstice Festival (冬至). Some families have a tradition of eating Tangyuan during the Chinese New Year period as well. 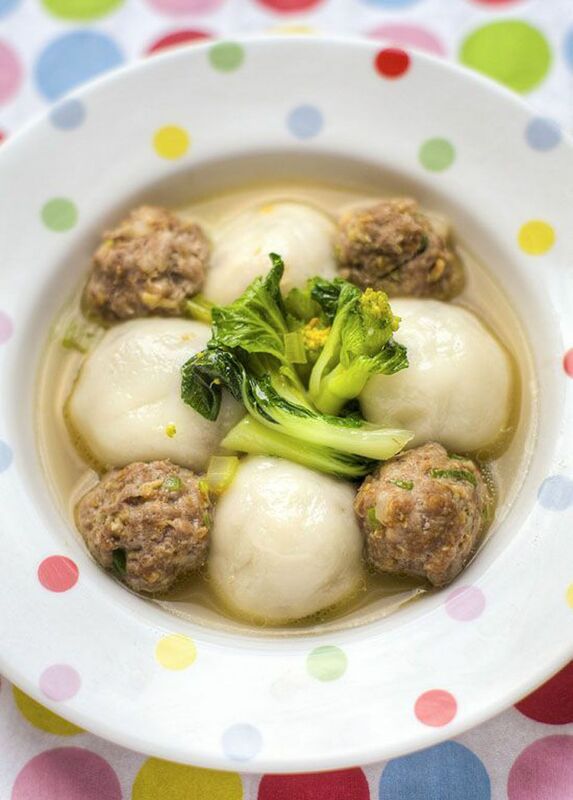 People in South China prefer to call this dish Tangyuan while the people in North China prefer to call this dish Yuanxiao (元宵). There are many different kinds of fillings and pastries that you can use for this dish, so there’s a multitude of flavors available. You can make this dish with a sweet filling, such as sweet ground sesame, ground peanut, red bean paste or even taro. Nowadays, many chefs will even put rose or chocolate in Tangyuan to cater to more modern sweeter tastes. This recipe is a savory flavor Tangyuan. The filling is pork with shallots and spring onions. This dish is served with some green vegetables, such as bak choy, and you can use vegetable or chicken stock for the soup which will enhance the flavors of this dish further. Mix everything and knead until smooth. Take 15% of the mixture and separate into 2 or 3 small balls and flatten them by hand. Boil some water in a small saucepan and cook those flattened mixtures until they float on the water. Mix the cooked mixture with the other raw mixture together evenly and separate the mixture into 25g each small balls. Mix all the ingredients and seasonings for the filling together evenly then leave aside for 20 minutes. Separate the filling into small balls and freeze them until hard (it’s easier to make tangyuan if the filling is hard). Use the pastry to cover the filling and make it look like a round shape. Boiling some water to cook the tangyuan and when they float on the water, they are cooked. Use another soup pot to cook stock while the tangyuan is boiling and add some chopped celery and dried shallots into the stock and season the stock with a bit of salt and sesame oil. Place the tangyuan into the soup and cook them together for another 1 minute. You can also put some vegetable into the soup such as Bok Choy or any green vegetable.